2004 celebrates the 20th anniversary of vidnaObmana. The past 20 years signified vidnaObmana as one of the most willful independent exprimental artists around. He recorded more than 35 CD albums, whether solo or in collaboration, that explored the abrasive side of electronic composition, the freeform landscapes of the isolationist ambient aesthetic, the structured interactivity of Fourth World soundscapes, international music traditions and post-classical experimentations. 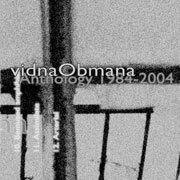 vidnaObmana’s anthology 1984 – 2004 release marks this celebration and covers vidna’s oeuvre from 1984 up till 2004. For the first time ever, this anthology links vidnaObmana’s most successful ambient period with his most obscure earlier phase. A period in his career that vidnaObmana refused to recognize up till a year ago when he realized that his experimental and noise phase created the foundation for what he has produced up till now. 12 selections range in style from ambient music in the vein of River of Appearance and his ambient Trilogy to harsh noise electronics from the early 80’s. An unique and provocative document confirming vidnaObmana’s essential position in the field of electronic and modern experimental music. This CD, the first in a series of anthologies also stands for the birth of vidnaObmana’s own label Ikon (This first release is in alliance with Projekt). The circle is complete and a new path lies ahead. 1. Shallow faith (previously unreleased, from ‘Legacy’ studio sessions – Belgium, 2003/2004) 2. Second praise for last hope (previously released, from ‘Untitled’ cassette, Ladd-Frith – USA, 1987) 3. The noctural air (previously unreleased, from ‘The River of Appearance’ studio sessions – Belgium, 1995/1996) 4. Ecstasy (previously released, from ‘Hope and Die’ cassette, V-tapes – Germany, 1984-1985) 5. Kindred spirits (from ‘Crossing the trail’ studio sessions – Belgium, previously released on ‘1654-The Cave2’ CD compilation, Hands Productions – Germany, 1998) 6. Darkness overpowers it all (previously released, from ‘Untitled’ cassette, Ladd-Frith – USA, 1986) 7. Soul dislocation (previously unreleased, from ‘Spore’ studio sessions – Belgium, 2001/2002) 8. By abundant rain (live) (previously unreleased, from ‘The Trilogy’ studio sessions – Belgium, 1990/1993, live in concert at Diogenes, Nijmegen – The Netherlands, 1991) 9. Only fear will survive (previously released from ‘Only Fear will Survive’ cassette, Ladd-Frith, USA – 1985, enhancement by Brian Ladd) 10. Bemused amphibian (from ‘Experience Artaud’ cassette, self-released – Belgium, previously released on ‘Ecstasy by Current II’ LP compilation, Schizophonia – Austria 1988) 11. Assimilate (previously unreleased, from ‘Tremor’ studio sessions – Belgium, 1999/2001) 12. Arterial (previously released, from ‘Landscape in obscurity’ cassette, S.S.A. – The Netherlands, 1989). Anthology selected, sequenced and remastered at the Serenity Studio, Belgium in February 2004.